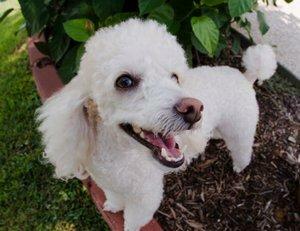 Guest columnist Wendy Nan Rees shares with us why brushing your dog's teeth is important. If you've been skipping this health care step, your dog's health could be at risk. Do you brush your dog's teeth? I can only be honest and tell you I only do my boys' teeth once a week when I clean their ears. During an interview on my radio show, I found out that we should have our dogs' teeth cleaned two to four times a year by a professional with no anesthesia, and we should brush them every day. I thought to myself, "Wow! How am I to get to everything, including brushing the boys' teeth?" However, as I learned some of the most important facts about dental health care, I realized that, one way or another, I was going to make the time. Here's why. Dental disease is the most common form of disease in dogs. Since our dogs are not self-sufficient and cannot brush their own teeth or take themselves to see the veterinarian, it is up to us as their masters to educate ourselves in cleaning our dog's teeth. Plaque, a sticky, colorless film made of bacteria, mucus and food, constantly forms on the teeth and can make your dog's gums very sore. Plaque eventually leads to tartar build up. Tartar, sometimes referred to as calculus, develops when plaque remains on the teeth for too long. The long-term effects of bacteria in plaque can lead to periodontal diseases. Gingivitis is as an inflammation of the gums. If left untreated, the gums will become infected and eventually recede, exposing the root of the tooth to further bacteria, and will progress to a condition known as periodontitis. Periodontitis is defined as an infection of the ligaments and bones that support the teeth. Dogs with this form of periodontal disease may develop abscesses, need root canals and eventually lose teeth. There are many signs of dental disease in dogs. Foul smelling "doggy breath" indicates the presence of bacteria in the mouth. The appearance of yellow or brown calculus deposits, usually appearing at the gum line, is another sign of dental disease in dogs. Red, rather than pale pink gums are also indicative of dog dental disease. The beginning of gingivitis is indicated by a red line at the base of the gums. Rounded edges, rather than pointed edges where the gum meets the tooth, are another indication of dental disease in dogs. Pus, loose teeth and severe sensitivity of the mouth indicate the later stages of dental disease in dogs known as periodontitis. Dental disease in dogs can lead to much more serious consequences, if not treated properly. Once bacteria get into the blood stream and circulate, any number of additional medical conditions can develop. If high levels of bacteria are present, the immune system of your pet will naturally be compromised. Circulation of bacteria can also lead to organ damage. Heart problems, especially heart murmurs, are common if bacteria circulates and deposits in the heart valves. Amyloidosis (a condition in which insoluble amyloidal proteins are deposited in bodily tissues and organs), often occurs in the liver and kidney of dogs with dental disease. It is quite serious when it affects the kidneys, as the kidney does not have the ability to regenerate. As a result it can lead to kidney failure and ultimately death. If left unchecked, dental disease in dogs can and will lead to a shorter life span for your pet. I hope I've given you plenty of reasons to begin brushing your dog's teeth if you're not already doing it on a regular basis. Check out Brushing Your Dog's Teeth Made Easy for more dental health care tips.